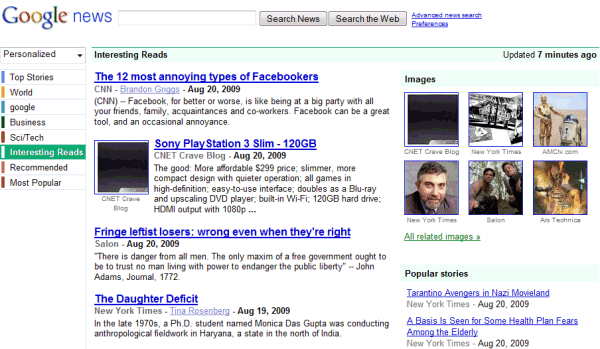 "Interesting Reads" is a new Google News section that includes opinionated, thought-provoking articles from news sites. Some titles: "The Daughter Deficit", "America's Food Crisis and How to Fix It", "7 Reasons to Avoid Windows 7". It's not exactly Arts & Letters Daily, but it's an interesting departure from Google's goal of aggregating and clustering news stories. Update: The feature has been launched and the section has been renamed to "spotlight". "The Spotlight section of Google News is updated periodically with news and in-depth pieces of lasting value. These stories, which are automatically selected by our computer algorithms, include investigative journalism, opinion pieces, special-interest articles, and other stories of enduring appeal. To access the stories in this section, just click Spotlight on the left side of the page," explains Google. "7 Reasons to Avoid Windows 7" - nice jab at your competitor. Keep it above the belt please. OK, I'll bite, how did you add this section? I don't see it available via "Edit this page"
I couldn't find it either. Following your link got me "Your search - Interesting Reads - did not match any documents." Maybe it hasn't rolled out for everyone yet? I could click on your link and see interesting articles and an interesting tab but I could not add it to my page. Interesting that Google now think it can tell us what's interesting. News.Google think it can be an interesting magazine itself. Looks like competing with your sources or biting the hand that feeds you. Who decides if an article is interesting or not? "The selection and placement of stories on this page were determined automatically by a computer program."